Giant Robo 2007 – New developments in whatness! The new Giant Robo is being actively promoted for English markets by its production company in the form of this site. Now, looking at that site, I’m finding myself asking “what have I done to you, Softgarage?” If you look at those character designs, it’s clear that they’ve revised the Giant Robo aesthetic. Giant Robo is not something that you can modernise. The whole point of watching it is so that you can feel like you’re watching anime of the sixties and seventies with a high level nineties budget, so expensive that years upon years are taken to animate the whole damned thing. On top of this, they’ve revised the Giant Robo “mythology”, in that it didn’t used to have a mythology. The point of the previous Giant Robo was the morality of the technology that had been utilised in creating Giant Robo; the inherent danger of the very utility of the robot versus the danger of not using him and having Big Fire win. If these are mystical “god robots” discovered by people in various parts of the world, I don’t know what to make of that. Of course, I shouldn’t say that something should slavishly conform to that which inspired it, but I sure would like it that way. 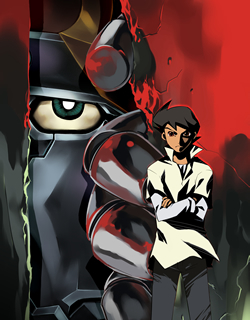 With only one character that I recognise, Giant Robo might be interesting, but it won’t be what I loved. Plus that site needs some editing. I mean, it has a “plomotion plan”. … and I shouldn’t complain about “authenticity” if you consider that Giant Robo of the nineties was a huge mélange of Yokoyama’s entire career. The three episodes that make up Giant Robo‘s “in-between episodes” GinRei Special, Barefoot GinRei, Steel Armed GinRei and Blue-eyed GinRei may as well have been called “Naked GinRei”. It is difficult to argue the canonic value of these three side stories, but they are occasionally insane and undeniably fun.